Front of Ocean Resort Hotel! Hotel Sun Beach is the first class resort hotel located at the oceanfront in Seoguipo, the beautiful port town surrounded by nature such as waterfalls. There are beautiful diving points at Seoguipo beach, and many divers visit the area to enjoy scuba diving every year. From the window of the room, guests can enjoy airy and relaxing view of beautiful Jeju ocean. There are 134 guestrooms with a selection of royal suite, suite, twin, double, ondol suite and ondol room. In 1F, there is a coffee shop, western style restaurant which offers a gorgeous landscape and Korean restaurant serving local Jeju food and special courses. There are also disco, karaoke room and massage room in B1F. Guests can enjoy the view of the ocean and Mt. Halla at the same time, and it creates a special and unique atmosphere which can be felt only in Jeju. With a stay at E-LANDPARK Sun Beach Hotel in Seogwipo (Seogwipo City), you'll be minutes from Cheonjiyeon Waterfall and Seogwipo Maeil Olle Market. 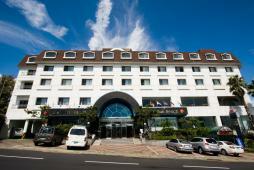 This hotel is within close proximity of Saeyeongyo Bridge and Jeongbang Waterfall. Make yourself at home in one of the 134 air-conditioned rooms featuring refrigerators and minibars. Complimentary wireless Internet access keeps you connected, and digital programming is available for your entertainment. Private bathrooms with showers feature complimentary toiletries and hair dryers. Conveniences include safes and coffee/tea makers, and housekeeping is provided daily. Enjoy a satisfying meal at a restaurant serving guests of E-LANDPARK Sun Beach Hotel. Featured amenities include a 24-hour business center, a 24-hour front desk, and luggage storage. A roundtrip airport shuttle is provided for a surcharge (available 24 hours), and free self parking is available onsite. The preferred airport for E-LANDPARK Sun Beach Hotel is Jeju (CJU-Jeju Intl.) - 29.6 km / 18.4 mi.